My boyfriend is such a lucky bum. He gets to indulge in every single item I bake, no questions asked. It's like, imagine for a moment that someone is always making random desserts without you having to ask, because that's what they enjoy doing, and you can just sit around and wait for the next thing to come out of the oven. I wish there was someone that did that for me, hah! Anyway, I asked him what he was interested in trying next, and he told me he really wanted something with lots of cinnamon in it. Ideas of carrot cake and cinnamon buns twirled around in my head for a while, but neither were piquing my interest at the moment. 2. Slice up apples and sprinkle with some lemon juice if desired to keep them from browning. Mix together white sugar, 1 1/2 tsp flour, and cinnamon together. 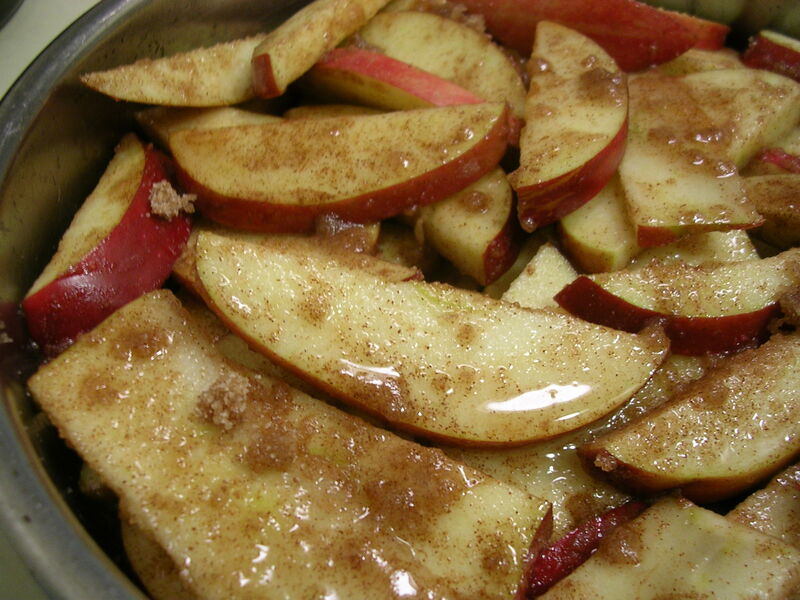 Toss apple slices in sugar mixture until coated. Evenly layer the apple slices on the bottom of an 8" round pan or equivalent. Pour the water evenly over the apples. 3. In a bowl, stir together oats, 1/2 cup flour, brown sugar, baking power, and baking soda. Using a fork, cut up the softened butter into small chunks and mix into oats and sugar mixture until you get mostly small crumbles about the size of small peas or so. Spoon over apple slices. 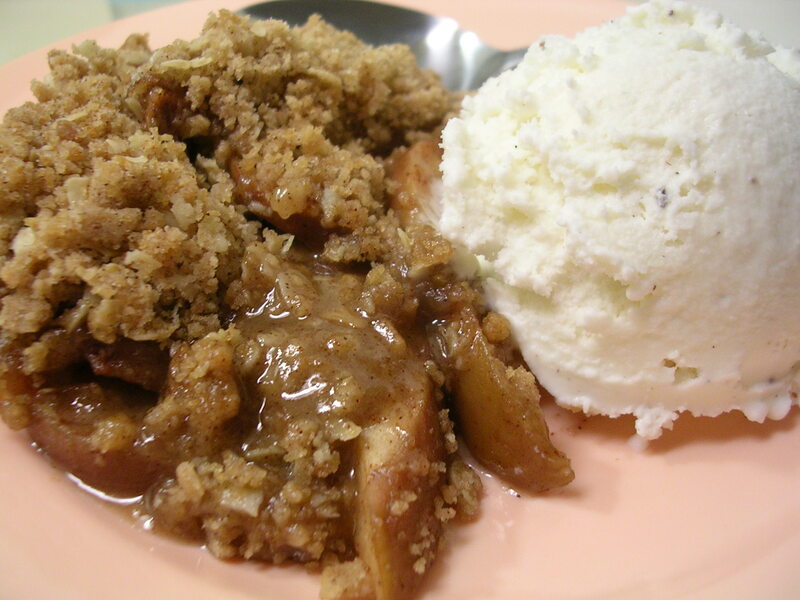 I think when I make this recipe again, a few changes I would make include peeling the apples first (I wasn't a big fan of the skin still being there), and maybe giving them a little bit of time to cook on a stovetop prior to assembling in a pan, since I think I would have liked the apples just a tiny bit softer. And finally, I would either add more butter or reduce the amount of topping mixture so that the butter to topping ratio results in bigger crumbles. But the amount of topping in this recipe is already plenty for my pan, so don't heed the reviewers of the original recipe that insisted on doubling the topping heh. 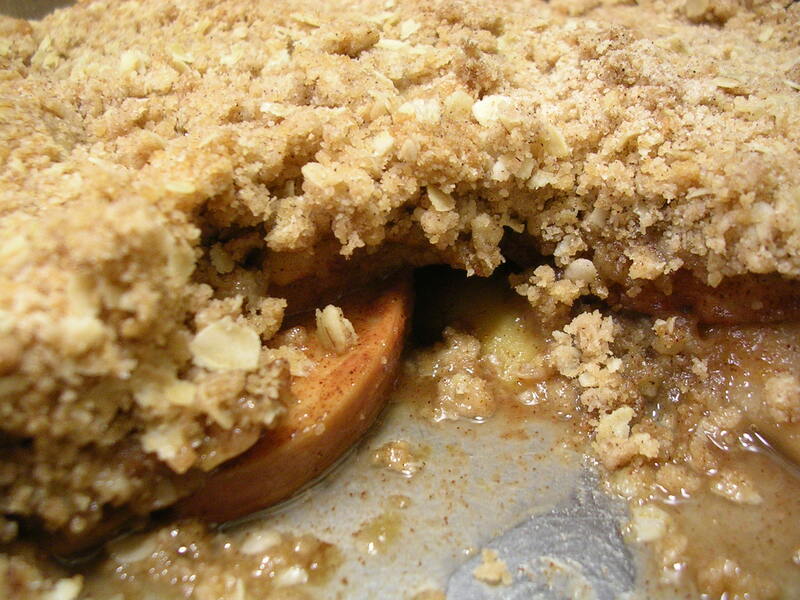 I was very happy with the results of this recipe… the apple crisp smelled so good while it was baking, the entire apartment was filled with its wonderful aroma. I just couldn't wait for it to cool down to dig in! I also thought it was really convenient that I could just sub in a package of instant oatmeal for the quick oats, and I'm sure the powder in the package added to the cinnamon flavor (I quadrupled the cinnamon in the total recipe and I thought it was just perfect). Yum! This entry was posted on Friday, February 22nd, 2008 at 6:46 am	and posted in American, baking, desserts, fruit and nuts, recipes, Uncategorized. You can follow any responses to this entry through the RSS 2.0 feed. yummmm…. 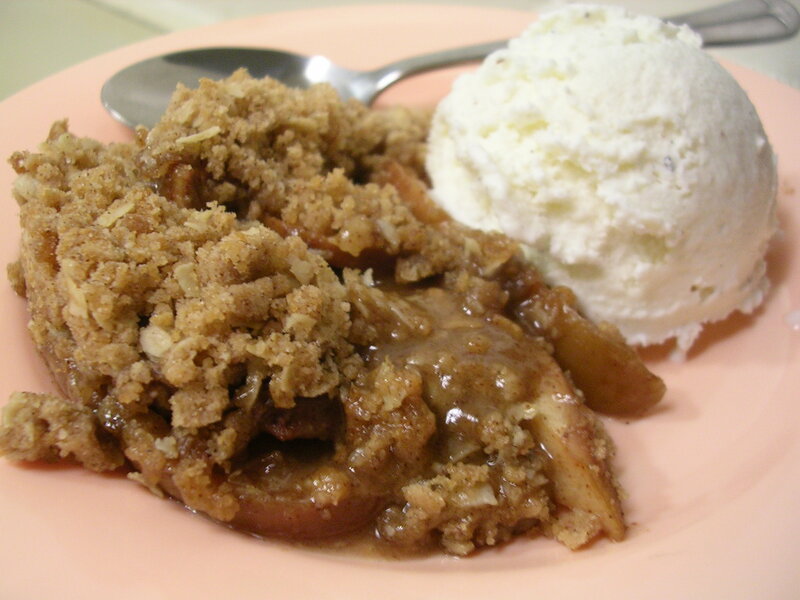 my dad used to make apple crisp in the fall when I was a little girl. He used the recipe from the Mennonite "More with Less" cookbook. Soooo yummy! 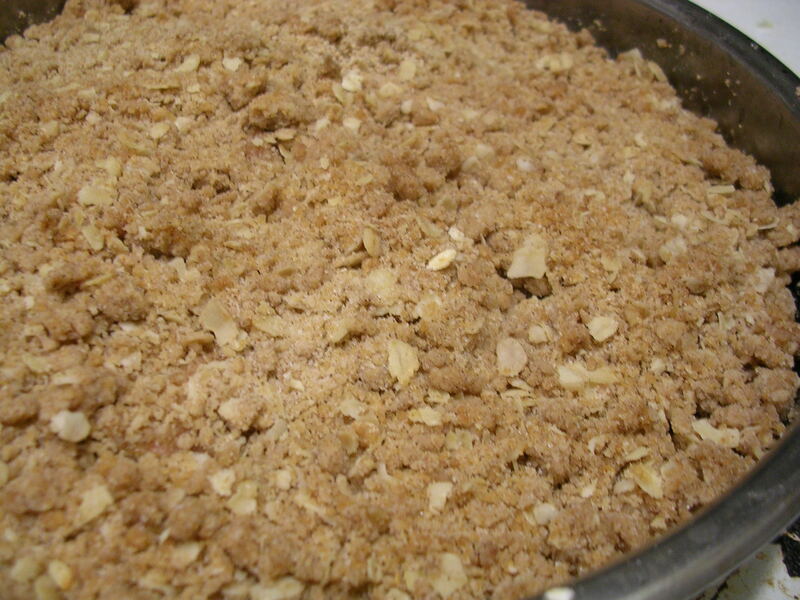 This apple crisp tastes great, I love it.